Drizzle stitch is fun as it stands free from the fabric. In other words it is a 3D stitch. It always makes me smile when ever I see it. It is mainly used in Brazilian embroidery worked in rayon thread but you can use any thread with a good twist such as cotton pearl. In Brazilian embroidery you often spot it at the centre of a flower adding texture and dimension. 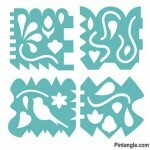 It also combines well with floral motifs work in Silk Ribbon Embroidery. 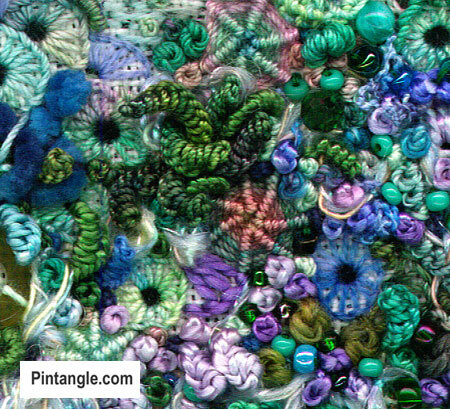 Drizzle stitch is a great to use in underwater scenes as clusters of the stitch it looks like coral or sea anemones. Since tension is important, stretch the fabric in an embroidery hoop or frame. 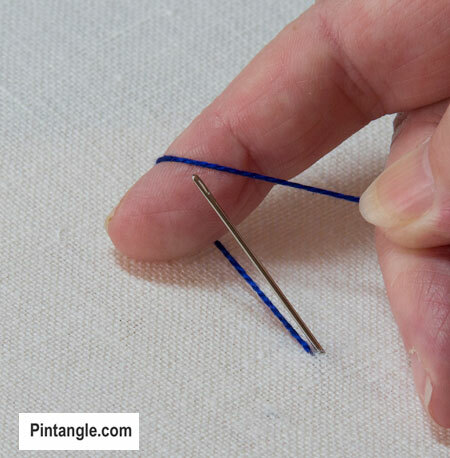 Also this stitch is easier to work if you use a use a milliner’s or straw needle as the shaft of the needle is the same diameter as the eye and this means you can slide the stitches along the needle easily in the second phase of the stitch. For all my, ‘you should do this’ and ‘should do that’ it is not that hard to work and more than makes up for its fiddliness with effect. Next to where the thread emerges poke the needle a little way in the fabric. Take the thread in your hand and wrap the thread over your index finger. 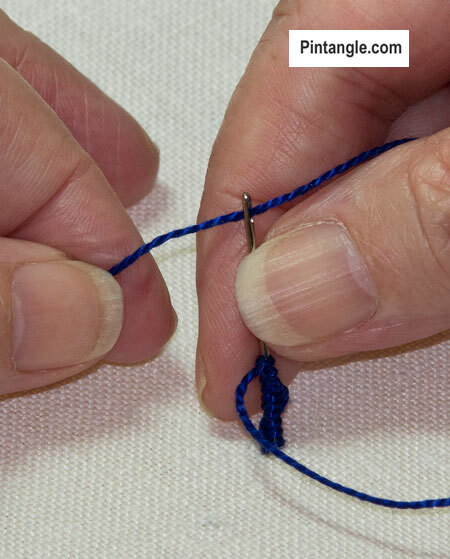 Rotate your finger keeping the thread still over your finger but under slight tension. This movement will create a loop around your finger. 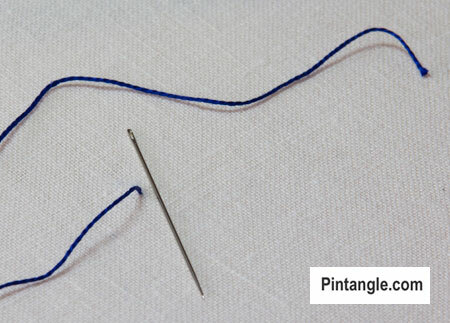 Transfer the loop from your first finger to the needle. Slide the loop down the needle. 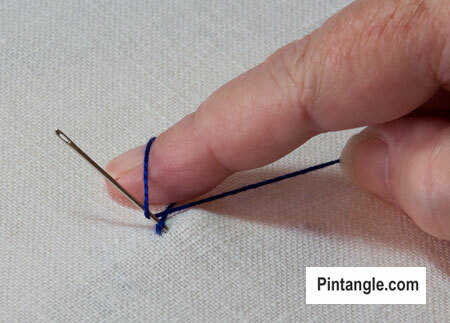 Then pull your finger away so that a loop sits on the needle. Pull the thread until snug but not tight. This is the first cast on stitch. 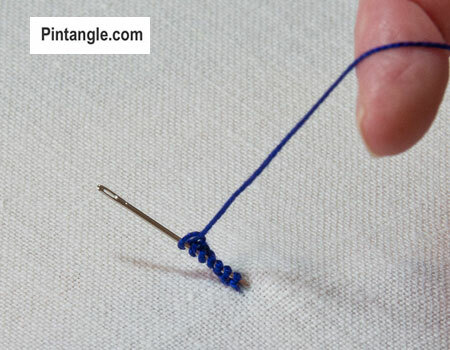 This looping action and transferring the loop to the needle, is similar to casting on a stitch on a knitting needle. Work a number of cast on stitches, gently sliding them down the needle as you go. Work at least 6 loops if not more. You can work 20 or 30 loops to create long spirals. Keep the stitches even on the needle. When you have the required number of even spaced stitches rethread the needle. Hold the cast on stitches between your thumb and first finger. Hold the stitches firmly but not so tight the thread can not be pulled through. 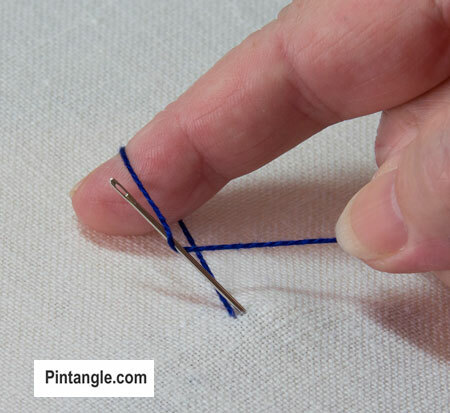 Gently pull the thread, through the center of the cast on stitches and continue to pull the thread through the fabric to the back. Pull firmly but not too tight. The finished stitch will be free at one end so that it will pop up from the fabric and will coil in a spiral to the base. 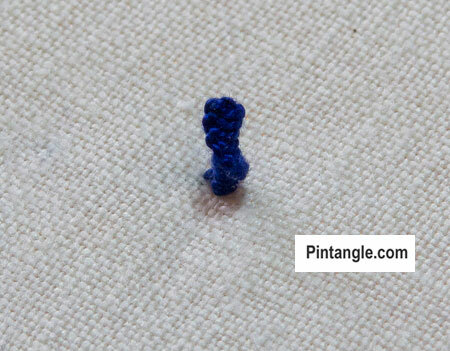 The size of the stitch depends upon the number of cast on stitches you use. The higher the number of cast on stitches the bigger the loop. 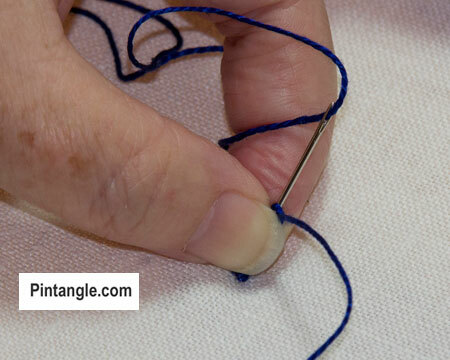 The thickness of the thread will determine the weight of the stitch. 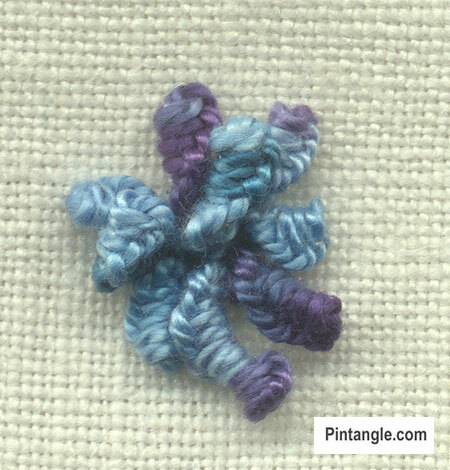 For a contemporary look mix this stitch with other textured stitches such as bullion or french knots. 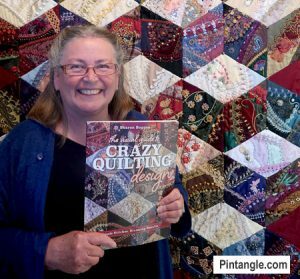 It also looks good used in combination with such stitches as cast-on stitch, oyster stitch, whipped wheel stitch, whipped spokes and add a few beads to the mix. I hope you have fun with Drizzle stitch! Yes Pacloue it is funny it makes me smile every time I make it! Thank you for sharing your amazing creativity. That looks like a fun stitch. Will have to try it!